Painting Acrylic and Oil on Canvas | 48" x 72"
Painting Acrylic and Oil on Canvas | 36" x 60"
With my art, I challenge the popular notions that are associated with love. A very common connotation associated with love is ‘falling in love’. But, I think it is an amazing paradox because when we ‘fall’ in love, we actually ‘rise’ in life. The pristine power of love changes the world around us and redefines our otherwise mundane existence. Its power is comparable to a divine healing touch, a revival of the soul. In my paintings, I try to show that as humans, we are flawed and we contain ourselves in shackles. But when love takes over, the shackles unbind all by itself, the spirit is emancipated. I strongly believe that a woman’s power can transform a man’s life for the better and that is the reason my paintings show that a man is motivated to be a better man, to transform his life, to go that extra mile and to chase those ambitions which he otherwise wouldn’t, if he gets a woman’s love. 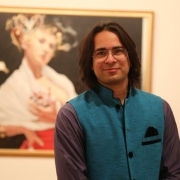 Ankur Rana has gained a lot of popularity amongst art lovers & clients alike with 8 solo painting exhibitions in India and more than hundred group shows. His paintings are a clear depiction of his creative and intelligent thinking. Known for his vibrant use of colors and figures, his paintings have enthralled one and all. His work adds a modern touch to the element of love between a man and a woman. His work depicts the mixture of traditional and contemporary outlook while expressing his inner ideas. He has won the hearts of critics not just by expressing the theme of his art beautifully but also because of the detailing and intricacy that is reflected on his canvas. He has experimented with his art style while creating motifs of ‘ambi’ used in traditional Indian clothing which has captured the imagination of the onlooker. His canvas always features surreal and utopian images that clearly depict his inner disillusionment.